I am honored to have as this month’s guest author one of my Leadership Coaching clients, Karthik Venkatakrishnan. 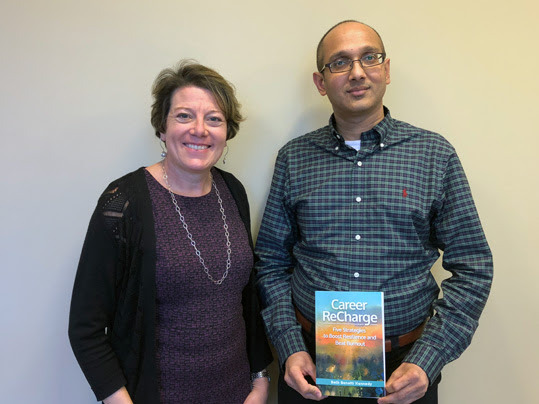 Karthik’s story is featured in “Career ReCharge: Five Strategies to Boost Resilience and Beat Burnout.” Thank you, Karthik, for your amazing leadership and for sharing the impact of the Benatti Resiliency Model. I am a clinical pharmacologist by training and work in a drug-development setting in the pharmaceutical industry. I began working with Beth Kennedy of Benatti Training and Development in 2013 during a period of career transition. I was moving from a job role that involved direct individual scientific contributions to drug-development programs and mentorship of scientists in my team to a leadership role with broader responsibility. In my new role, I took on accountability for clinical pharmacology strategy and deliverables for the oncology section of our portfolio through line management of a highly accomplished team of scientists. This transition, while exciting, was daunting and required me to enhance my resilience. Beth made this happen for me through instilling the fundamental principles of the Benatti Resiliency Model in the way I work. Her practical tips for success—big and small—were crucial in helping me focus my time and talents on what mattered most an d what was realistically within my control, thereby minimizing futile distractions and ultimately enhancing my efficiency and effectiveness. Beth taught me that a key part of one’s career fulfillment is taking time to explore his/her brand. BRAND is a dimension of the Benatti Resiliency Model that I believe is foundational for leaders to personally discover and emulate through the course of our thoughts, words, and actions. Working with a thoughtful coach like Beth made this possible for me. Beth would regularly ask me variations of a simple but profound question: What kind of legacy do you want to leave? It’s incredible how much catalytic power this question carries compared to traditional questions often focused on metrics of success or accomplishments such as:What do you want to be five years from now? The concept of legacy is powerful as it promotes selfless but aspirational introspection, inquiry, and reflection, culminating in enhanced SELF-AWARENESS which is another dimension of the Benatti Resiliency Model. In my case, this process of guided inqui ry into my aspirations in the broader context of my strengths and areas for development enabled me to re-discover the critical importance of building trust in the workplace. I describe this as a “re-discovery” because my first formal introduction to the importance of trust as being foundational for success was through participation in Stephen M.R. Covey’s Speed of Trust workshop. Our distinguished leader Dr. Michael Vasconcelles had integrated this learning experience as part of our leadership-training curriculum. For this and a lot more that I’ve learned from Dr. Vasconcelles, I remain very grateful. With brand attributes established and self-awareness enabled, what ensued is deep clarity in thought that enabled focus on overall WELL-BEING, another strategy of the Benatti Resiliency Model. From the first day of working with Beth, I learned the critical importance of recharging. Whether it was through simple maneuvers like taking a brisk 10-minute walk between meetings during the middle of a workday or planning a vacation, Beth taught me the importance of making time for myself. I discovered that minimizing clutter in my office space was a simple way to enhance clarity of thought and efficiency in the workplace and increased my resilience. I also had the opportunity to recommend Beth as a coach for a member of my team who was an outstanding scientist but showing signs of an impending burnout that impacted the person’s ability to innovate and collaborate in the workplace. I watched how Beth was able to transform the well-being of this colleague through rei nforcing the critical importance of recharging and practicing work-life balance. In the case of this colleague, simple practical tips like stocking up on healthy midday snacks in the office and staying hydrated coupled with a forced calendar reset to incorporate vacation time went a long way to rejuvenating and recharging for enhanced productivity. Over nearly two decades in the pharmaceutical industry, I’ve learned that change is constant in our profession. Beth taught me that building resilience with a focus on one’s personal brand and well-being can enhance quality of life at work, professional and personal fulfillment. The Benatti Resiliency Model offers a simple, yet comprehensive framework to enable this and should be part of everyone’s leadership-development toolkit.